Let's start with the bad news. So happy I was, Dikkie came home on Wednesday. We went to the vet in the evening, she's a very straight, but sweet person. She took another look at Dikkie, and after some talking to one another, she said, that she could do some research and tests on him, but she was afraid it wouldn;t just be a bad working kidney. His belly didn;t feel and looked good. And she was afraid that even after treating him, it wouldnl't get better. So at the end Jan and I decided we should put him to sleep. Oh, it was such a hard decision, but I didn;t want him to feel aweful anymore. To tell it as short as I can, I took him in my arms, the vet gave him first a kind of anesthesia injection and she left us alone for a few moments. When she cme back he got his final injection and he passed away very quietly. Still some tears are running on my face, as I write this down, I am such a softy in these things. But I could see Jan had a difficult moment too! It is better this way, and I am sooo glad he has gone to cat heaven lying in my arms. Because the uncertainty would have beeneven worse, not knowing where he was, what happened to him, if he didn;t came home. So now we are left with only one cat. I could tell Brodski wasn;t in his usual mood too. I think animals somehow feel it when it goes bad with a buddy. It's already coming to almost normal with him, but he spends a lot of time very near to us at the moment. Do want to thank everybody from the bottom of my heart for the sweet support on Dikkie Dik, all those kind words and thoughts, you're amazing! 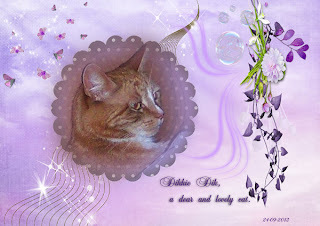 Wednesday morning, when Dikkie wasn;t around yet, I got so busy in the house. Kind of reaction to all I think. Jan to work, I did get a few necesaary grocerie things, then changed the bedsheets, washed the curtain from the bedroom, cleaned the window, inside and out and as I was busy anyway outside, did the big window from the living room too. In the mean time washing machne did it's job, so that was done too. Clean windows and curtains can make a you happy for a moment LOL! Top get my mind off the events, I spent quite some time at the computer too and started a bit of "new"project, at least for me. And the result.....yes, I can say I didn't do a bad job, there are still some improvements to make but it's rather nice. The result you will get as freebie today. 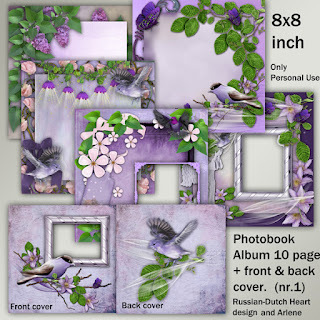 It's a photobook album, made with the Devine Silence kit, used there also the clusters from Arlene, so you could say it's a kind of collaboration kit. The albim can stay on your harddisk in a file(some of the pages are for "blended"photos or photos with perhaps a mask, and a few have a frame to put them in. You also could try to print them yourself and make a little photobook, for yourself or somebody else, but I think it will cost a lot of ink, and photopaper, and fuss, so you could let a service print your photo album. There are lots of companier that can offer you a nice result. Prices differ very much, as well as the way of uploading your photos there and so on. So I did just a little bit of reading here and there and have a few links for you, that might help you to decide where to go and what to do. 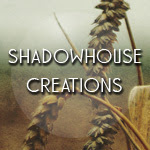 Take a good look around on this site, they have lots more of interesting posts, also tutorials, resources, so take your time. Oh, also don;t forget to read the comments on all sites, they can be very helful too and some have great tips! And if you Google photo books, well, you get a lot more to read if you need to. My great cluster creator(grin) did spoil me again with some great clusters, from kits not publshed yet, yeah she does a real terrific job. But as promised I first will catch up on the clusters from kits already posted by me, and if it is all coming together as I think, we can start on Monday with kit plus matching clusters. Yippee! It takes some time, but given some time I CAN get organized, ROFL! Now first Arlene's clusters for the Never Let Me Go kit. And now the "new project". 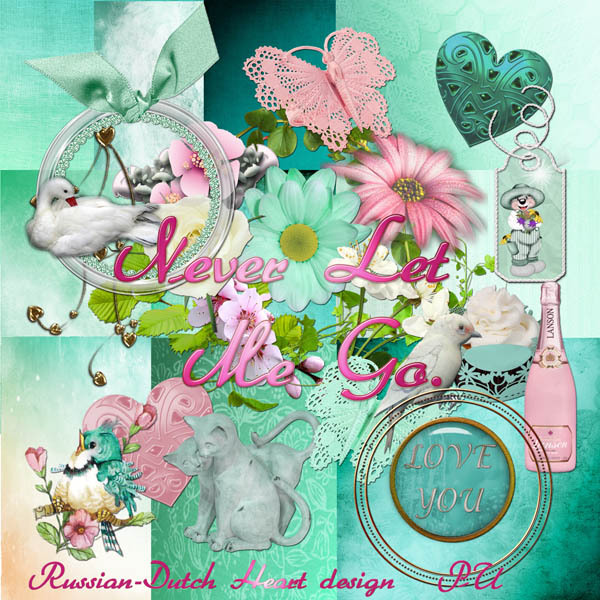 I made a preview of 5 phto pages, but there are 10 in total, each one has an opposite page, so in fact you have a double paged album. And I also made a front and backcover for it. I'll show you first an example of a double page(no photo on it, but you get a better idea of the whole, and then the preview of the pages. Pages and cover are made in 8 x 8 inch. Hope you have some use for it, and it's allright if you make some extra books(or copies) in case you want to use this, perhaps offer a book to somebody for a birthday, or anniversairy, or whatever you use it for. Still my Tou rules for it, just personal use, no money making out of it. Perhaps not necessary to say this, but there are weird people out there on the net, so it's for them I say this. Now have slowly got to start doing some things around here. Jan is working this morning so I want a few things been done, by the time he gets home again. May be we'll catch a little nap this afternoon, hmmm, it sounds not bad, hahaha. Have a fantastic weekend, see you on Monday! P.S. Let me know if you are "in"for more of these photobook albums? Must say I love making them. Perhaps, next time I could make it in a different size? Something as 7 x 5 inch? Your reactions are much appreciated. Thanks. Oh and if somebody perhaps, may be, in the case of, etc. should really let print an album with this, please, please, please, send me a picture of it?? Really would love to see the complete result. I know, I ask a lot, but I am so curious! EXTRA EDITION! MIRACLES DO HAPPEN!!! You will not believe it! Dikkie is home again! under a bush? Dikkie lying there. As poor looking as before, soI tried to put a little bit of food in front of his nose, no, he won;t eat. So now we keep him inside, whether he likes it or not and this evening we will go to the vet. May be it's just for a moment, that we have him back, but there is still hope. Just had to post this. Keep fingers crossed that we will be able to keep him for much longer than 1 day. Monday morning I could get hold of Dikkie Dik, but he had to stay in the room for a couple of hours, till we could go to the vet. And he had to go out for a little pee or so, and so Jan let him out, saying he had to because Dikkie already was stressed. I wasn't happy with it, but couldn;t blame him. Well, I tried calling him, and finally he showed up on a little shedroof, but far away enough we couldn;t reach him. He knew something was going on! And that was the last we saw of him. I think we will not see him anymore. It's not his way of staying away from home for two days now. So Jan and I think he went to his favourite place somewhere outside and left this world. The same happened with our former cat! But it's so frustrating not to know what happened to him. I know somewhere in my heart he probably will not show up again, but we will keep an eye for him still this week. I was all messed up yesterday, oh, I did some things in the house, kept busy, more to say, did something at the computer, but every hour or so I went into the garden and whistled for him, without result. It hurts me to know he spent his last moments all alone, I've wanted it to be in a different way. But he was more an outdoor cat than an inside cat, perhaps it suited him. Forgive me, to talk such a long time about him, but he was such a sweet cat, and I cannot help that I have again tears in my eyes, while typing this. And it looks as if his brother Brodski somehow knows it. He also behaved a bit different the last couple of days. We still have a little shred of hope, but deep down in my heart I know different. We'll just have to accept that those things happen. Well, back to daily business now, life goes on, we must carry on, how hard it may sound, it's true. 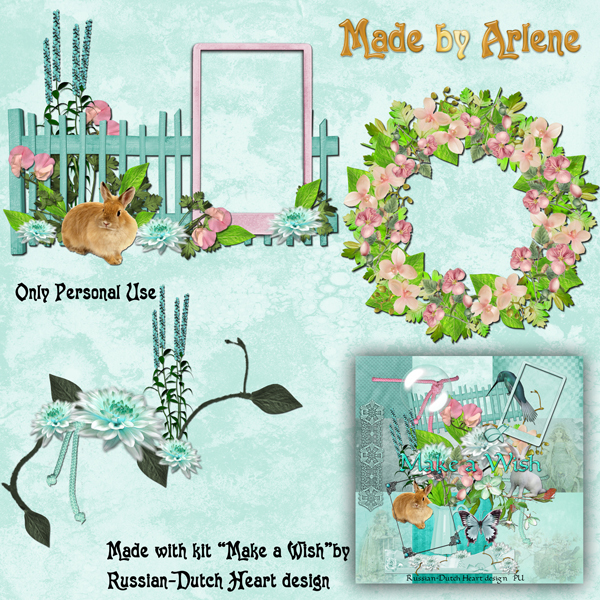 I've decided to post some more clusters from Arlene today and Friday, to catch up with the kits, and then next week I'll be able to post the kits as well as the matching clusters. I hope that's okay with you. Fist are the clusters from the "Change of Season kit." Then here the "Go Steampunk"clusters. Still it doesn't feel completely right, just posting Arlene's clusters, so I dug up an older kit, that was only available for download on Minky's special blog, and I think a lot of you might not have downloaded it. So here a little fantasy kit, named "Fairies Dream Too". Hope it still will be of use for some of you. 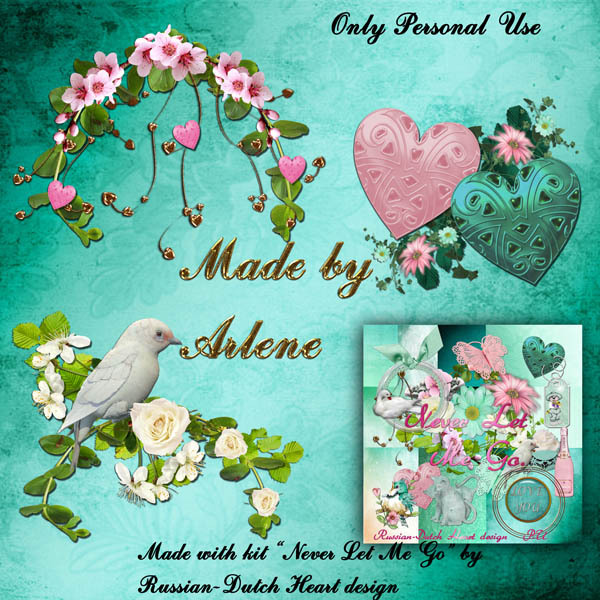 For the ones who have this kit already, sorry ladies, but probably already Friday I will have a new thing to download for you, and next Monday we start with the usual downloads, a whole kit and matching clusters. Aren't you too cross with me LOL? Have to shake myself up a bit, still feeling down about Dikkie Dik, but there are thinggs to be done(although I probably will peep out every now and then in the garden to take a hopefull look around, yeah I know, it's against better knowing it, but still...). Thanks for all your sweet words and support, it cannot really ease the hurt, but it helps a lot! You are fantastic! What will today bring us?? In all the weekend was not bad. Jan had a lot of work, but today he is having a free day. Weather is a bit so so at the moment. Rainy sometimes, colder, but still not really bad. I was busy looking after Dikkie Di the last few days. I know I told you he was doing a bit better, that was around Wednesday. But after he had finished his cure on Thursday, all seemed to turn worse again. Not eating or really almost anything, and I have to hold it in front of his face to get him eat it, and even then not much. So today we will go again to the vet and see what will happen next. This may sound not really nice, but we will have to make some decisions. If the vet wants to make an echo e.g. we will have to ask first, what it will cost us, because vet prices are high. And we just have to be very careful with our money at the moment, and cannot spend a couple of hundred euro for this. If there will be an echo and it will show he has kidney problems, next question will rise what to do about it. Perhaps operation, or just a specail diet? I have no idea. And will that make him really better again? And may be it will show that he has some bad tumor. What to do then? I all cases I don;t want to have him suffer, and certainly not hustled about with all kinds of treatments and such. Perhaps the best thing will be then to put him asleep. I just don;t know yet. But I don;t have a good feeling in my stomach. Still let's hope it wil show to be a minor thing, and that I worried too much, although it already is going on for about 3 weeks now, that he really isn;t the Dikkie Dik (dik in Dutch means thick or even fat) he was earlier. He is looking so poor and skinny. It breaks my heart. Well, this was all going through my mind during the weekend, and of course I tried to think about other things, and distract myself, but it's always on the background of my thoughts. Lucky I have my computer, it helps to be busy and think for a while about other things. It's not a very uplifting post at the beginning of the week, sorry. But there are some nice freebies again. 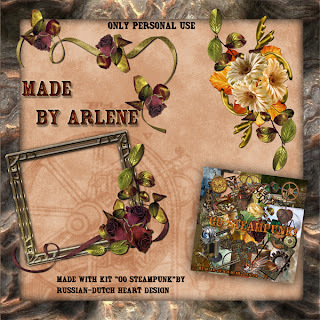 Oh, Arlene sent me a bunch of new stuff yesterday, wow! And I still had in store some of her last "shipment". 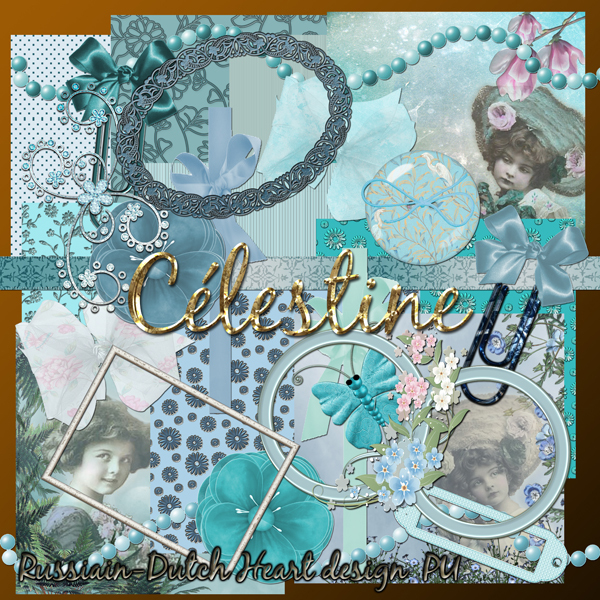 You still have to have some clusters from her made with earlier posted kits, but today I will do a different thing. 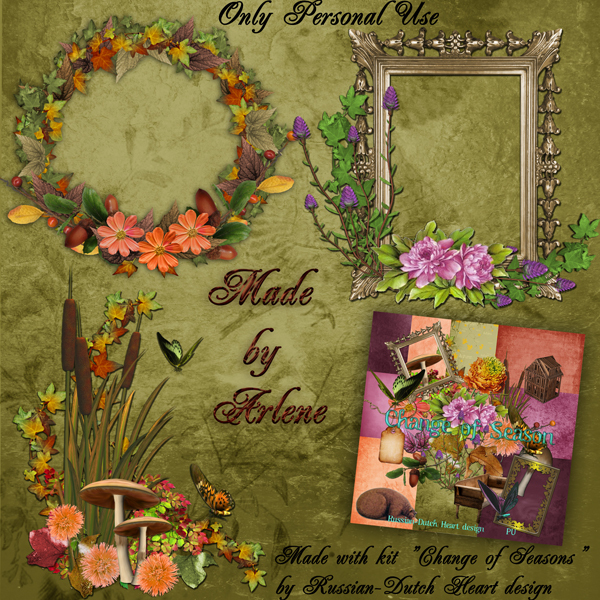 I will post a kit and at the same time the clusters Arlene made with it. Good idea? 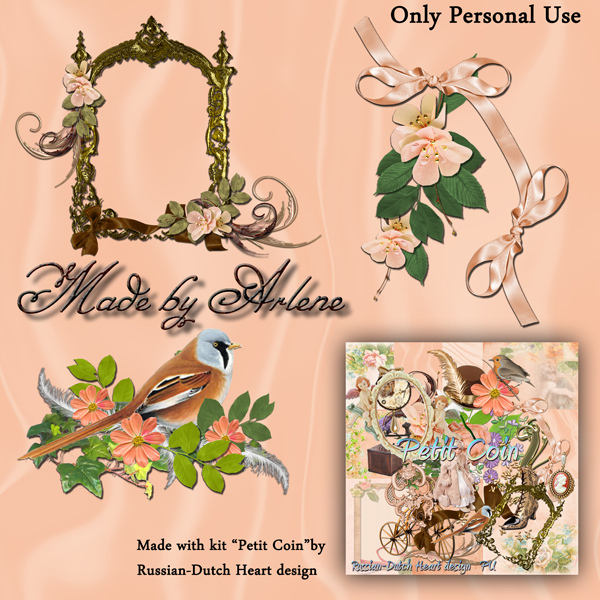 And I may post the clusters from earlier posted kit in one post this week, without perhaps a kit of mine, or may be another kind of freebie from me, and then we will be on track to post a kit as well as the matching clusters at the same time. Oh, gosh, quite an organisation! So here we go, first the kit and then the clusters. Today''s kit is in one of my favourite coloors again, yeah! 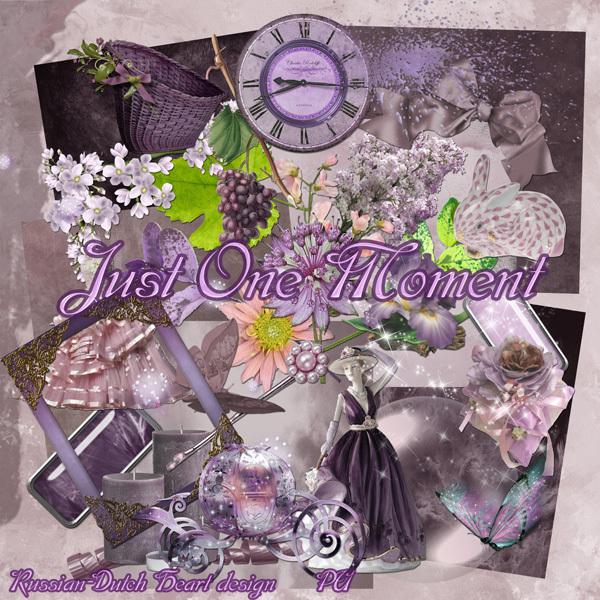 It's named "Just one Moment". And the clusters are just adorable! Have a wonderful day, I hope mine will turn out better than I feel it to be at the moment. Oh, cleaning can make you happy LOL! Can you believe that in about a weeks time we will be in October already? I rememeber that in March I thought it was still a long time before summer came by and suddenly it's over with and we are heading towards the last 3 months of this year. We are growing old faster and faster. Gosh, after taking a bit easier day on Wednesday, I got real busy yesterday. First already rather early I went out to do some shopping, have all I need for the days to come, came home a little bit soaked, because I just catched a short rainshower LOL. So first I took me another coffee and a sandwich, by the time I had that in my stomach I was dried up again. And then into the kitchen, with a buchet of water and some cleaning stuff in it and started with the cupboards. Took all the stuff out, sorted it through, cleaned the inside and outside, re-araanged all the things a bit better, got rid of things I really didn;t need or was too much etc. By the time I was almost done, Jan came home and I could proudly show him the result LOL! But it feels good to have it done and all clean again. Almost done there, only a few drawers are left to do, hmm may be I will tackle that today, they are only small ones, so not lots of work. Just got a mail fromArlene, happy to read she was okay after a tornado passed in her area(she only had to deal with a lot of broken branches and a few trees that have fallen down, but not on her house), but now she seems to have problems with an update of her PSP program. How frustrating is that? Having an update done, hoping it will give you some better or quicker features or whatever and then it's not working properly? I think she will put her former version back again. All talks and trading have started now in our politic department, just wonder how long it will take before the two parties come to an agreement! And may be they will not! They both say they have the intention to clear the job together, but there are real big differences between the two parties, and although everybody nows that deals and compromises have to be done, some of your principals you cannot let go. At least if you are a rather honest politician and you want to hold on to some of the promises you've made to your followers. We'll see what will happen next week or so. I have to direct you to Linda's blog, because there you can download a beautiful made quickpage with my Steampunk kit! I'll give you the preview but download is on her blog! 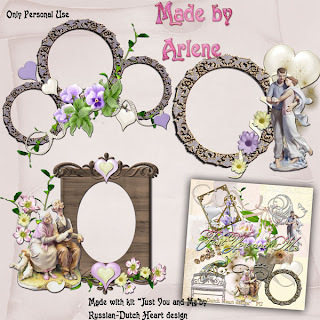 Clusters again from Arlene. 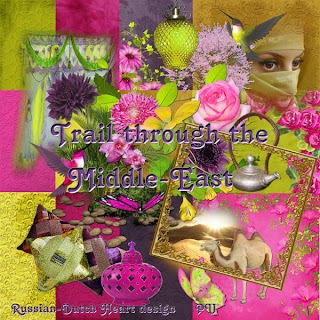 Made with the Trail through the Middle-East kit. And from me a light colored kit, you could say a tiny bit romantic, named "Never Let Me Go." Will be for a moment longer at the computer, perhaps start already another kit, have no clue yet what color or so, but that usually comes when I start my PSE program, suddenly decide the color or colorscheme and slowly the idea forms itself into my brain, what it will become. Strange way of working perhaps, but often it works well for me. 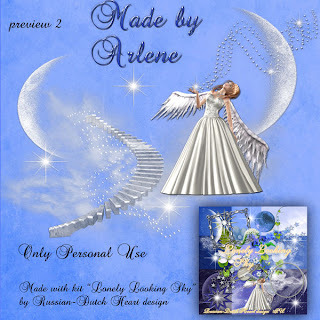 Have a wonderful weekend, thanks for all your visits and comments, always love them and also thanks from Arlene. Jan's checkup visit at the hospital was good news. His doctor there(a female, I like her, she's really a good one) told him no strange blood vessels were found, also no sign of tumors or whatever. Still she had found a small change in his bloodsample, so to be sure all is well and it is just a temporarly thing, he is going to have a MRI scan one of these days. Well, good that she wants to be sure and gives him the checkups before something really is wrong. And hoorray, Jan has found another bike, second hand but it's a good looking one, a bit more expensive than the other one, but I don;t mind, as long as he can use this one for a real long time LOL! And good he found one, because he already has work the whole week, all morning shifts, only Saturday he has morning and evening shift and Sunday an evening shift. Dikkie Dik isn;t yet completely the old one, but now he goes to his food himself and eats. Not much at a time, but if he does it several times a day, I am happy too. He even eats now the little hard ones again(must say I bought a pack of different ones for now, I know they like them) LOL. So let's hope it will goup more and more. Still we have to be alert and monitor him well. I was all active yesterday, wow! Did a laundry, washed the curtains from the front window, cleaned the window, plus all the glass windows in our doors, oh, even did some shopping, and was about ready with it when Jan came home. We watched a bit tv, it was the opening of the new year in parliament, called Prinsjesdag. It's always nice to watch, the Queen rides in the Golden Coach, and speaks out the new "plans"of the governmnet for the next year. That isn;t the most interesting thing, but I like to see the ride of Her Majesty with her son(Prince Willem-Alexander and his wife Princess Maxima) and all the parade and things around it. Now there has to be formed a new government, but it will not be so easy, I guess. Out of the elctions came two parties with really a lot of votes, so normally they should form the government, but they are two rather different minded parties, know what I mean? It will take days or weeks to talk everything through, everybody has to compromise, of course but who will give in the most? Hmmmmmm, we will see what happens. In the afternoon I did some designing and later made our dinner, of course. I have made on Monday some minced meat kebabs, and there were left a few so we finished them and I made pasta with it. I already had some ready made tomatoe suace and spruced it up with some left overs from red and green paprika, some mushrooms and black olives. First fried the cut paprika, threw in the mushrooms later and then mixed it with the tomatoe sauce. Pasta isn;t Jan's favorite food, but I like it a lot. So I had a great meal, Jan a bit less, LOL, but it tasted well ! Weather really has changed now here, every day we have some rain, temps are much lower, although thank God we also have some periods with a bit of sunshine. Still you can notice Autumn is in the air. 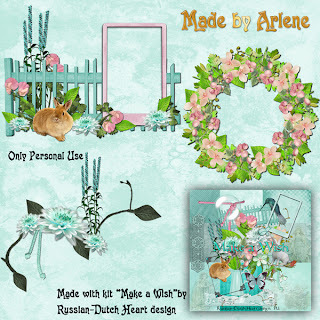 Clusters from Arlene, yeah! 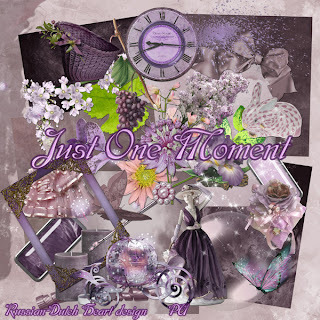 Wonderful ones, made with the Just You and Me kit. 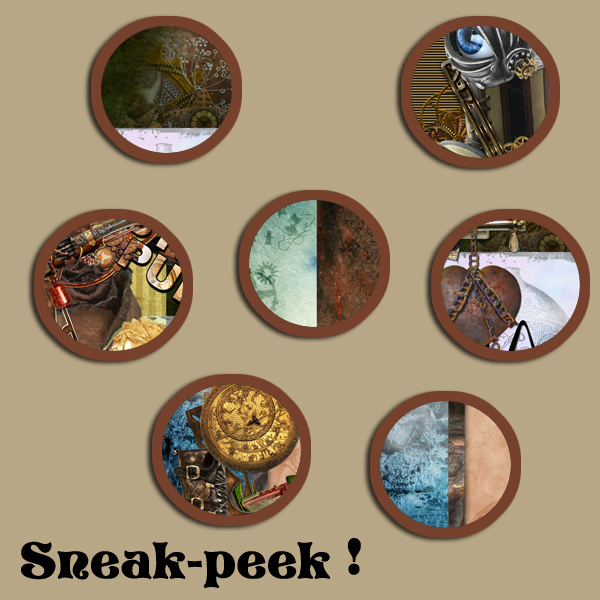 And do you remember the sneak-peek? I decided I will post that kit today. 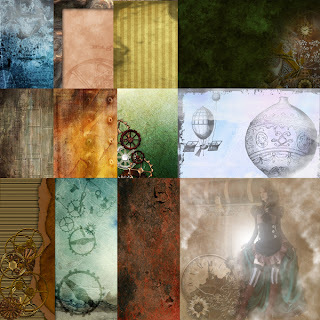 I've made two previews, one of the whole kit and one of the papers, so you can have a good view on them. 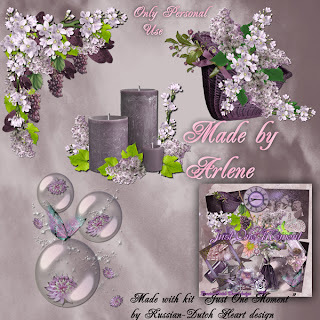 I really loved making this kit, it has been a long time since I;ve made this kind of kit. I will reveal now what kind of kit it is(if you didn;t already had an idea LOL). 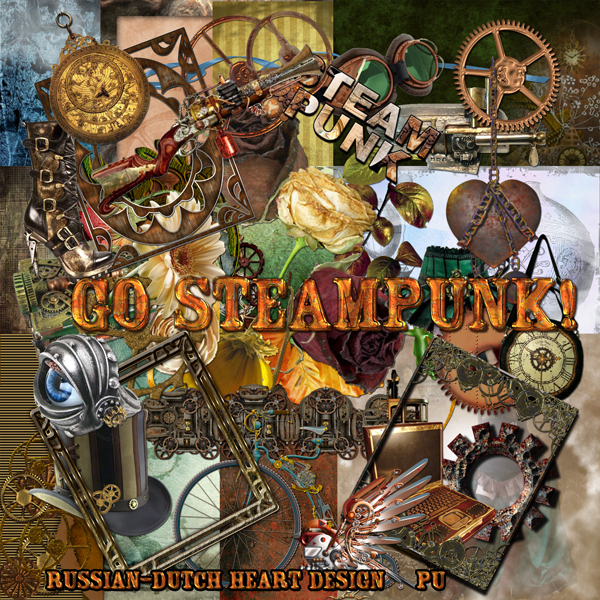 It's a kit named "Go Steampunk", well name says it all. Bad things happened, due to aweful people. Don;t get too startled up by the post title, we are okay, but still there has happened a bad thing to Jan this weekend. He had evening shift on Saturday, but he came home rather too early again, so I was curious how come. Then he told me the bad news. When attending to a patient/client for a short visit only, he came on the street again and..............his bike was gone. Simply STOLEN! So he couldn;t finish his round, had to walk back to the central post, tell them about it and then came walking home. What miserable types are that, who just steal a bike, that is locked, placed against a house, so not looking abandoned at all???!! And Jan's bike is crucial to do his job. Oh my, I was sooooo pissed off, not to mention Jan LOL! Okay, no need to go to the police for a declaration, first his bike wasn;t insured(only a second hand one) and it takes ages to make that declaration and result is practically zero. So today Jan first is gone t a doctor's appointment at the hospital for result of his echoscopie and then he has to search for another bike. That has to be another second hand, at the moment we cannot afford to buy a completely new one. Not nexessary neither, cause you can find real good second hand for a nice price. I truly hope he will find one today, because tomorrow he has already work scheduled and without bike he would have to cancel it. Damn, all was going rather good at the moment with acceptable amount of hours for him and now this again! Quick about Dikkie Dik. It seems he is feeling a bit better every day, he is now on his pill cure, that will end on Thirsday. Eating still isn;t great, but at least he does eat something. I have to put him in front of his little saucer to push him eating, butthen he takes some pieces and even some more when I feed him by hand. Imaging, our cat the biggest eater of the two needs to be fed by hand. Okay, if it needs to be done for a while, I will do it. He takes something to eat about 3 times a day a bit, so all together it is already more than at the beginning of last week. Still crossing fingers we won;t have to go again to the vet. Hahaha, I was so p.d off by the bike stealing I had no energy left on Sunday, so I spent almost all day at the computer LOL. But today some work has to be done so I must hurry up a bit. Oh above all also our iron died on Friday. So I had to buy another the next day too. Sometimes money just flies out of your pocket before you even have put it in ROFL! So I hope we will have a more luck this week, and why not? Better to try to stay optimistic as much as possible! And my freebie for you is a bit different one. 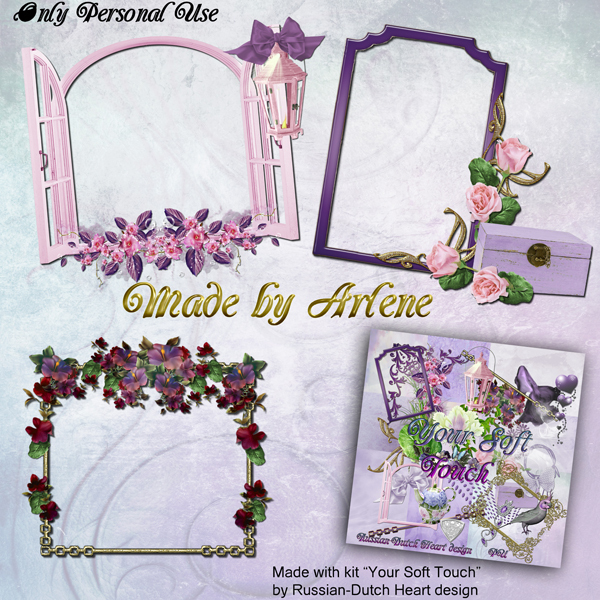 I love to make sometimes a fantasy kit, but I didn't do that this time. 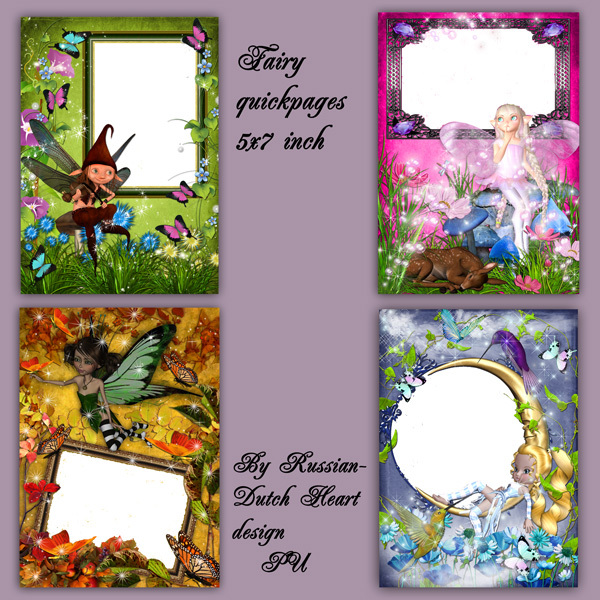 I've made some quickpages for you, in fantasty style. 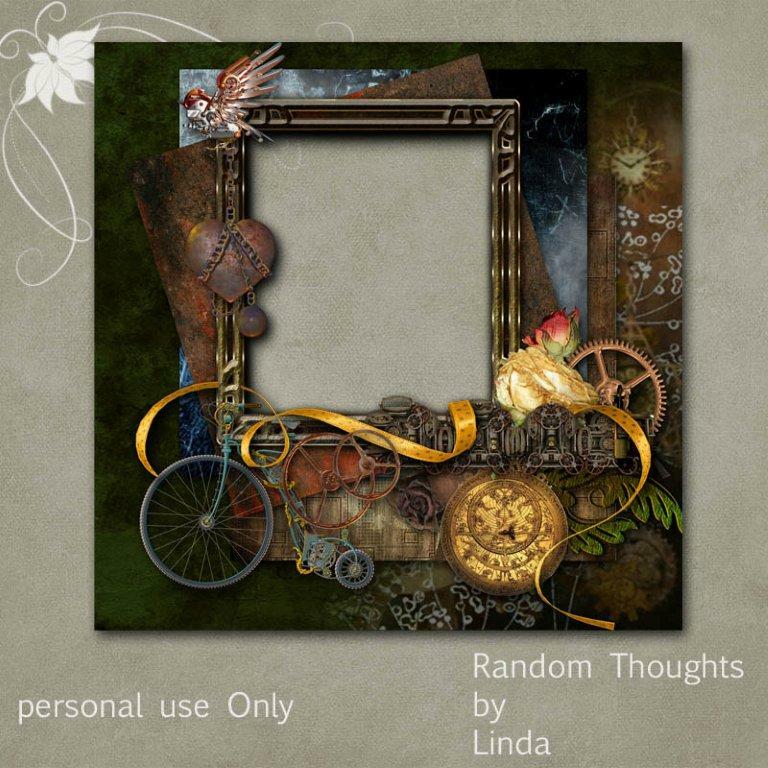 And was inspired by Linda, who makes sometimes smaller quickpages, that you can print out if you want and frame it in borderless one dollar frames from e.g. Wallmart. 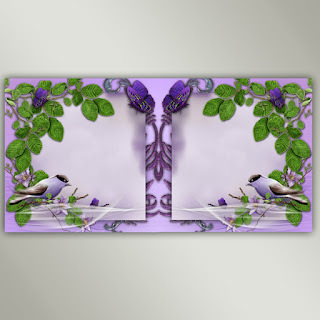 So I thought these could be nice in a bedroom from a grandchild, or somwhere in your own house with a sweet picture of your child when they were still young, or with a grandchild. I have four recrangular ones in a 5 x 7 inch dimension and 4 square ones in 6 x 6 inch dimension. Hope you can make something with them. Now I really have to get moving, shopping to do, ironing to do, preparing something for dinner, and possibly a couple of little householdchores more. Going to the vet, can be a problem! Well, I start with what is bothering me the most at the moment. Our Dikkie Dik. I got Jan to the point to go to the vet yesterday. We wanted to go in the afternoon, but I first had to get Dikkie into the house. So I whistling and calling yesterday in the garden and oh yes, he came near. But he stopped on the little roof of a neighbourshed, and that was it! I could do what I wanted, it seemed as if he felt there was going to happen something strange with him! Luckely we had another chance, in early evening they had another walking-in consultation hour. So I started around 16.30 calling Dikkie Dik. That took a lot of patience, but after a while, oh wonder he came to me. I took him into the room right away with closed door! Around 18.30 we went to the vet. She is a very noce lady, she looked at him, told us that perhaps, only perhaps one of his kidneys could be the problem, but as easy something else. She took his temp, and he had a fever. Then she injected him with some sort of anti biotic, gave us some pills to give him starting Saturday, and told us to see him that would give a change. Keep him in during the night and if nothing changed after s few days, come again and then she suggested she would make an echo, to see if that would give some answers. We went home again, I prepared a little saucer with some chicken filet(!) for him and a little water too in the room. He wasn;t too happy about that, but finally he lay down and even slept a little. Also I manged to let him eat a few pieces of the filet, not much but it was a start. This morning he was happy to get out of the room, but... stopped for a moment in the kitchen to drink a little bit and.....yes, he even had some chicken filet again, I first had to point it out to him, but then he did it all by himself. Now he is out, I cannot keep him indoors, he has to do "his thing"outside, never was used to do it on a litter box. Well, he did even looked a bit better this morning, so let's cross fingers, that the spiral keeps going up and that in a few days he will be eating by himself and much more again. Pffew! I am a little reliefed, and so is Jan! By the way, going to the vet isn;t the cheapest thing to do! And still this one isn;t the most expensive. But if it helps, I am glad to pay! They changed a bit Jan;s shifts, the shift on Sunday evening was redrawn, but in place he has now two double shifts, today, the morning and evening and tomorrow afternoon and evening. It's a bit long, but hey, now he comes to an acceptable amount of hours. 62-63 F. Even there is expected some rain, so not all too nice for Jan being a lot outside. Perhaps the sun will come out in the afternoon, shich will look at least a bit friendlier. It might be a temporarely dip, LOL, who knows, somewhere next week it might be better again. You can count with it, this change, it;s the time of year for it. But I hope there is still some nice autumn weather in store! Yesterday I took a "free"day, LOL, well, I wasn;t much in the mood for anything with Dikkie Dik's situation, so Jan had his paper reading day and an extra nap, and I spent a lot of time at the computer. Today must be different, have to do a bit of shopping and some household chores, perhaps, and prepare early dinner. May be I leave the chores for tomorrow afternoon. Wednesday I already did some things like a clean of the toiletroom and a vacuumsweep through the house and such. Yes, now it's freebie time ROFL. 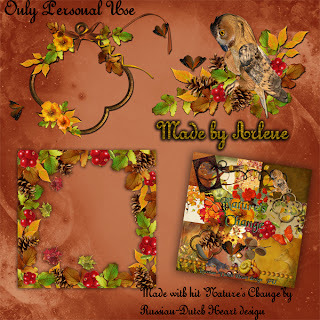 From Arlene lovely clusters made with the "Make a Wish kit"and my kit is a seaon related one again, because I love those warm autumn colors. 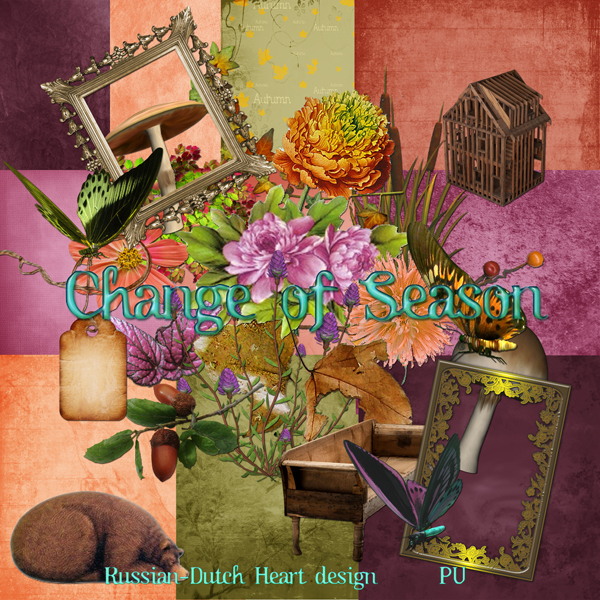 So here is Change of Season and I can promise you that I have one more Autumn kit in store for you! Have a great weekend, thanks by the way for all your sweet support and compassion concerning Dikkie Dik! Worried about my Dikkie Dik. I am worried abou tour cat Dikkie Dik. Something isn;t right with him. He was always the one who had great appetite, looking more than healthy, a nice round shaped and heavy cat. But the last few days he isn;t eating, or almost not, I tried all things they really adore, like fresh heart, chicken filet and minced meat, and normally both cats swllow that with pleasure and in a rush! But not Dikkie Dik anymore. Just a few little pieces and that's it. I saw he still drinks water, thank God for that. It can happen, that once in a while cats aren;t just in the mood for a lot of food, but this is diifferent. I tried to figure out if he is in pain, and I cannot tell. I don;t think so, but he doesn;t feel well, I can see that. He also lost weight, of course, so may be we should watch it for today and if there's no change, I want to go to the vet with him in any case tomorrow, but if you ask me, I already want to do that today. I know, Jan isn;t the quick running type when it comes to that, and sometimes he is right in waiting a bit with it. But now I am feeling myself real nervous. I so hope it willl not be something real bad with him. I don;t want to miss him yet. We have the elctions for a new government today and I am definately going to vote. None of the parties will get the full majority to form the cabinet, so there will be a coalition, which is not a bad thing. We always had that. But how long will it take to form a new cabinet? There are some big differences in program between the parties, so if you want it or not, there must be done some compromises. It is an important day for the future of The Netherlands. I hope a lot of people will vote and that they will use their brains a bit LOL. Jan is working this morning, so it's quiet here now. However soon I want to hop into some clothes and get some things done, e.g. I think I will tackle the toilet/bathroom section. Oh, yesterday we had the mess of the gas pipeline change, we even had to shut off the gas for a few hours. But rather quick in the afternoon they told us we could use it again, we checked it and all worked fine. Now they are "repairing"the sidewalk again, I am glad, cause all that sand was moving into my house LOL. Not too much, but every time you come from the street you pick up some of it and the hallway and even sitting room isn;t the right place for it. So probably I will take out the vacuum cleaner too this morning. 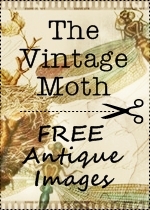 Before I will post the freebies I want to tip you for a few lovely downloads on my fellow scrapperblogs. 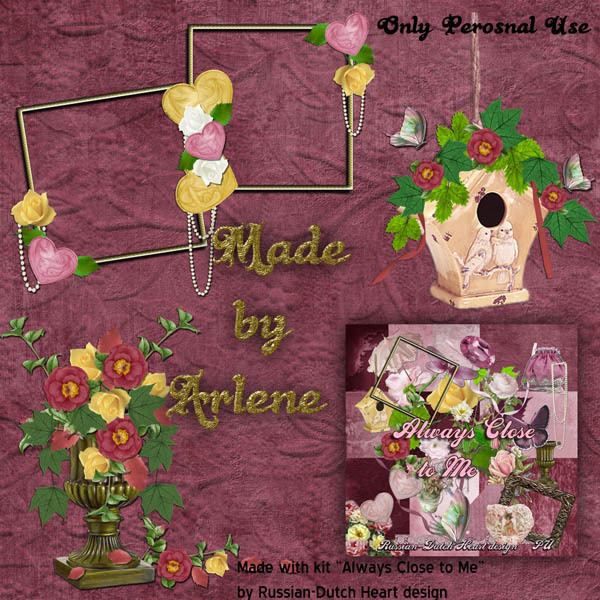 On to Arlene's clusters, and today there are some wonderful ones made with the "Close to Heaven"kit. 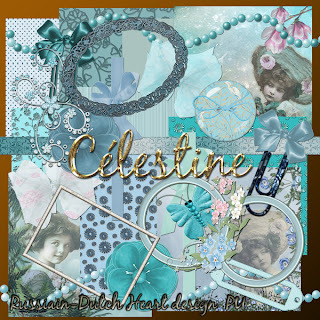 And my kit is "Celestine", rather nostalgic, and a bit vintage you could say. Hope you will have some use for it. Now after another coffee I will give myself a kick at my bottom(ROFL) and get started in the house. Mess at our front door today! Well, if I wanted to or not, I just had to wake rather early today. How come? The guys that are repairing or changing some pipelines, started this morning just in front of our house! The noise waked me, because they first had to lift part of the tiles and then dig out the sand, with a machine that makes NOISE! Oh well, I hope they will be ready by the end of the day, one can always hope, isn;t it? The weekend was ever so quite. Jan worked Friday morning, so i did my things, but he washome a bit earlier than I thought, so I wasn;t even ready, had to give the house a good sweep with the vacuum cleaner. And then he told me, he also had to do an eveningshift that same day. Okay, nice for the money, but I had to change a bit the plans for dinner. So the evening I was alone, but it passed real quick. I watched the match of our Dutch soccer team, they won with 2-0, that's good, but the team still has to grow a bit. Then there was The Voice of Holland, which I didn;t see. No, I watched some debating from our politicians, which can be sometimes interesting. And it's good to do, cause coming Wednesday we have the elections! Then Saturday- and Sunday evening Jan had to work too, so during all the weekend I was alone in the evening, sniff! It's not dramatic, but some programs on tv are nicer to watch when you do it together, like a quiz or so.We always try to give the answer on questions before the other does, LOL, and if we have the right answer and the candidate on tv doesn;t we always look at eachother with a look like: "How is that possible, he(or she) gives the wrong answer? It was sch an easy question! " It's just more fun together. During the day we just sat in the garden, it was beautiful weather, and I also had some computer time and really was in a creative flow, wonderful! Today it still should be nice weather, although it is changing. It rained a bit, and still is cloudy at the moment, but later today the sun should come out again. May be a good time to go out for a little walk together, who knows? Any idea what kind of kit this is? It was fun to make this one, and I am happy with it. Oh, have to get something of my chest! Last weeks there were the Paralympic games. And I thought it a real shame that on tv they only had about two sessions of half an hour to show just flashes of all events! Remeber the Olympics some weeks ago? Every evening there was one channel that covered all events as much as possible live, during the whole evening and during the day there also were some flash backs and so on. Shame on the people who just gave the Paralympics a few moments on tv. It should be left to the choice of the public, weather they want to watch it or not, we have several tv channels so they could do it on one and give the other programs on the other ones, isn;t it? But I think the athletes perhaps deliver a bigger effort than the valid athletes, one should admire their determination and will power and they achieved great things. And you know what? Sometimes you feel a bit akward to watch handicaped people, let's be honest about that. But watching a good volleybal match, or a sprint of any sport, you just forget about their handicap, it are very exciting matches and I have great admiration for all those athletes! That said, I think it's about time to finish this blogpost. So here are first some clusters from Arlene, made with the kit "Petit Coin". 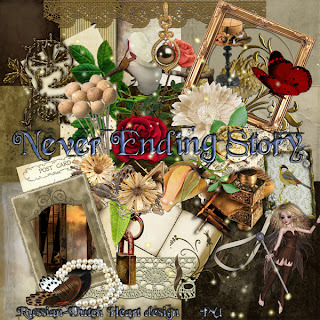 And my kit for you is a versatile one, I think, good for some heritage scrapping, as well as a lot of other subjects, it's name is"Never Ending Story". I will take my second coffee, and play a little in PSE, perhaps I can finish the kit I started on in the weekend. May be a bit boring to read all the time about our weather, but after a quite rainy summer we are having some great weather now and still lasting! So why not be enthousiastic about it? Wednesday Jan came home with the message we had to have early supper, cause he got an evening shift too at the last moment. And he was annoucing it with a rather happy face, LOL. Yesterday he was free, so could take it easy, but when I was doing some ironing, I heard some noice coming from the garden. So I peeked out of the window and saw Jan busy there, making a mess of the terras, sorting out all pots and stuff that was collected there the last few months, cleaning the tiles, levelling some of the tiles with heaps of sand, etc.etc. I must say he did a good job! Well, during my ironing, I already put some of the clothes and things in the closet, but then I couldn;t stand the bit of mess that always arises after some time, so I took out all of it, arranged it nicely again, switched some things from one closet to the other, and it looks much better. And yes, Wednesdaymorning I did give the fridge a cleaning up, sorted out the content and it looks sooo good again. Sometimes you can feel happy about yourself, because you actually did what you planned and when it works out fine, it's hoorray for yourself ROFL. Today Jan is working the morning, so all quiet here, but there are a few things to be done. Have to get me a refill for some of my medicin, have to sweep around the vacuum cleaner. There will be time left with that, but I'll see what I can do more. Hmmmm, also have to drop a bill at the bank, and I am sure I am forgetting something. In our street it's a bit of a mess now, they are changing some pipes, I believe for gas, so parts of the sidewalk are broken up, you have to slalom walking there, in a way it might be a good thing, because they lay down the tiles again after they have done the job, and perhaps that will be an improvement. I just saw that they arrived at our front door, so we have the mess now. Hopefully they will be ready with it today, otherwise it will stay "broken up"all weekend. It is good for one thing, LOL, Jan took a bit of the sand there for our tiles in the garden. Yeah, he snatched it, oh what a bad guy! This evening there wil be a soccer match from the Dutch national team, against Turkey, preliminaries for the world championship. Well, I am curious to see what the new coach did with the team. It appears he has changed several players, I think that was a good idea, but I have no idea if the team is already strong enough. You know I am a soccer fan, so hopefully they will not disappoint me, hahaha. 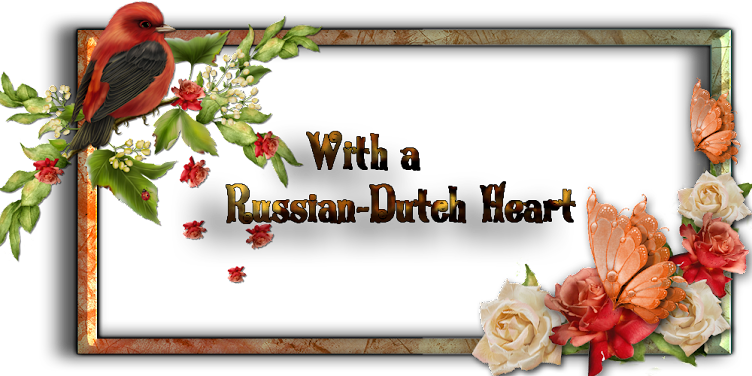 Then there also is "The Voice of Holland" and certainly some more to watch, it will be a busy evening. 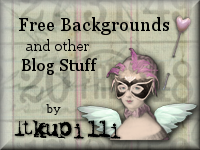 So, after all this rambling along, I think you deserve some freebies. 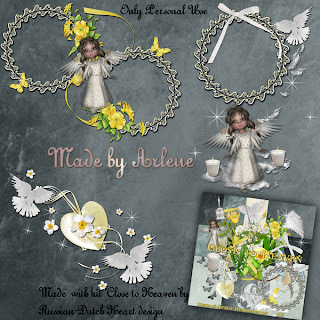 First some lovely clusters from Arlene, made with the Your Soft Touch kit. And I have a bit different kit for you today. I run into this colour pallette and somehow it made me think of something middle eastern. 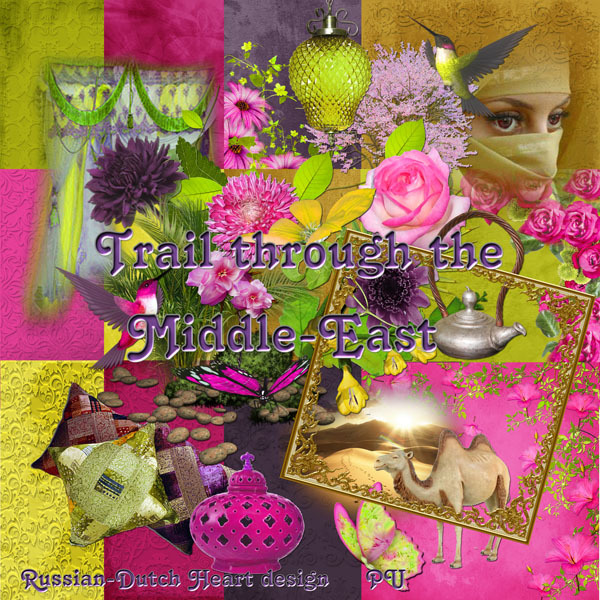 So here you have "Trail through the Middle-East". I hope you can use it somehow, I must admit I love the bright almost neon pink color in it, a bit tempered by the yellowish- oker and dark purple. 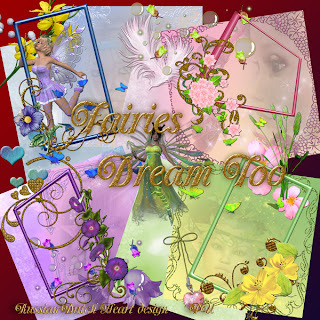 Let your fantasy work and I am sure you come up with some marvellous things! Time for another coffee and a bit longer computer time(woring on a great kit, well, I think it will become a great one, not giving you a hint yet, but may be after the weekend I can give you a sneak-peek!). The day for the elections for a new government are approaching, just another 7 days and then we'll know. Every evening there is something to do about the elections on tv, like yesterday evening a debat between the leaders of the largest parties. It was an interesting one, but you only can hope that if one or more(it cannot be other than a coalition) will form the government, they can fulfill there promises. That's always the question, LOL! But these debats can be of help (a bit) to make a choice. We'll see next week where it will lead to. And then there will be the formation battle, can they compromise enough towards eachother, to form a government that can change something? Hopefully that will not last weeks and weeks, like last time. Oh my, what a wonderful "aftersummer"we have at the moment, don;t you call it an Indian summer? It really is nice weather, good temperature, not too warm, oh so nice. Hahah, I played "secretary| again yesterday. I told you Jan's schedul;e for this week wasn;t too bad, but he could do with a few more shifts. So I mailed to the agency, first complimenting them with the nice work they do( and it's a true thing), but then asking if they could try to give Jan a shift or two more. And I got mail back, that they were trying too arrange something and a little bit later, yeah, we got message his schedule had changed, and he got an evening shift on Saturday. So now his only day off was Monday, he keeps that as a free day, and no shift on Thirsday (yet). But Friday a morning shift and Saturday and Sunday an evening shift, is already okay. (The weekends are always great to have, because that pays extra). Well, about that mail to the aganecy, I don;t do that too often, but every now and then I think it is a good thing to shake them awake a bit. And when you do that with a bit of humor, they don;t mind it too much LOL. Well, thats about all. I am thinking about "my work"today, here in the house, grin grin! It might be a good idea to tackle the fridge, it could do with a cleaning. Always a bit of a mess, cause eyou have to take everything out, but also a good chance to clear things out. Yeah, I think I will do that, and if some energy is left I could do some ironing too. Hmmm, also we must not forget to take a bit advantage of the good weather as long as it is still there, perhaps Jan and I can do something this afternoon. Oh, I tasted my blackberry jam yesterday, and it isn;t bad at all! Yippee, I could make some more, perhaps a good idea to take plums this time. Depends a bit on their price at the moment. 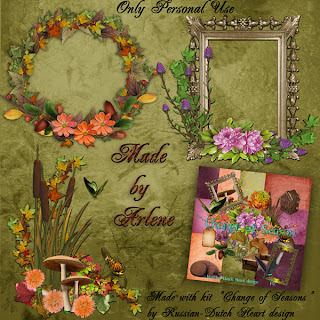 Now the freebie from Arlene. I had to make 2 previews of these, to do them right a bit. This time they are made with the Lonely Looking Sky kit. I think they are adorable and beautiful! She even made you a wordart! 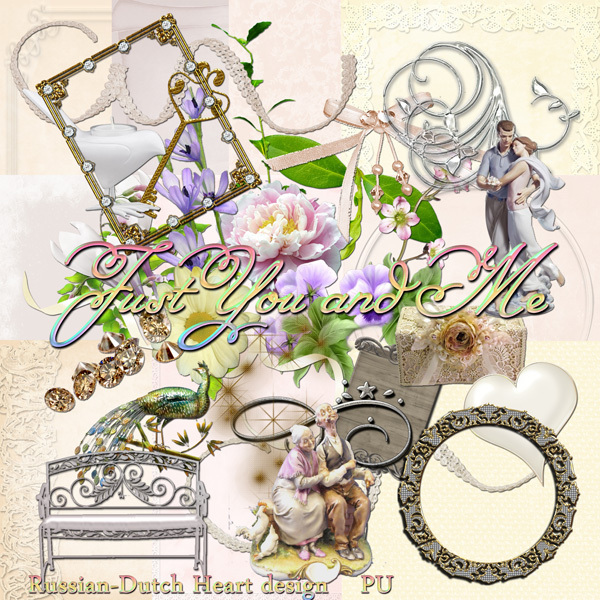 And the kit is: "Just You and Me". Very soft kit, and I myself am in love with one of the elements in this kit, the statue of the two aged people I found. Don;t you think that is fantastic? Well, hope you can do some nice layouts with this kit. On friday I had such a nice surprise! During the day I checked my bankaccount, and I can do that by phone, very handy. And you had to see my face when I heard the balance! Much more than I thought it should be. Didn;t understand it and listened to the amounts that were payed to me. Didn't figure it out, so as I was in the neighbourhood of my bank later that morning I popped in and asked if they could tell me from where that amount came from. It happened to be from the tax office, a refund from taxes.! Oh my, now THAT is really a nice surprise, totally unexpected. Now I only hope they didn;t make a mistake LOL, so I "parked" the money on another account for the moment, but now we have a little reserve for moments Jan may have not so much work and the balance is too poor. So I was a very happy person that Friday. I did that morning all the shopping necessary, at different supermakets and now the freezer is all filled up again. It is a bit of work, to make smaller packages from the bread and the sandwichfilling, but it's oh so handy. Saturday we were up early again, Jan to work and I did some householdchores, so by the time Jan came home around luchtime, all was done! I knew there was a little fair not far away so Jan relaxed for a moment and then we went out. It was great weather, only the fair was kind of disappointing, so we took a longer walk, all to towncentre, using an "alternative"route to it. That means we go through little streets we don;t know, but seeing all kind of lovely gardens, little houses we loved to own, LOL, exploring corners of The Hague that we still don;t know. Nice day, yes, it was. Sunday I took it easy on myself, Jan working the morning again, and I did nothing, I just was parked at my computer. Ja had a very easy an quick shift, so he was home earlier than I expected. I knew there was another fair, also not too far away, so weather was nice again, and we walked to it. Now that was nice little fair. Not very big, but all the stands had home made products, some of them offered for a little price something to eat, there were lots of people and we also saw several of our "old" acquaintances, of the time we still went to "our"cafe where we had that geat group of friends too. Oh, it was a real nice afternoon. And today we have an all free day, meaning Jan isn;t working, so no waking up with the alarm, but a little bit later, and that is oh so wonderful ROFL. That was our weekend, and now the new week has started, already we have September, it's unbelievable. One thing is for sure, if weather could stay the same as now till the end of November I would be a very happy person, but I am afraid it will not. Lets not complain before it is necessary and be greatful for the nice weather we have at the moment and live it by the day! 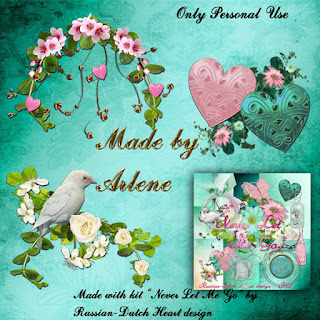 Perhaps you could take a moment time to visit a "new"blog, it's from one of my followers and she makes real nice things with my my kits(not only with mine, but they are used a lot). The blog is written in German, but she has a translator on it, so it shouldn;t be a problem. You even can download some of her stuff, freebies for personal use, so why not take a look? 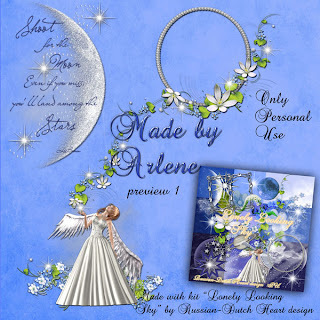 Okay, time for some great clusters again from Arlene, and she keeps me busy, because this weekend she did sent me a lot of new stuff again! This time she offers you clusters from the "Always Close to Me"kit. Hope you have some use for my little kit, named "Make a Wish". 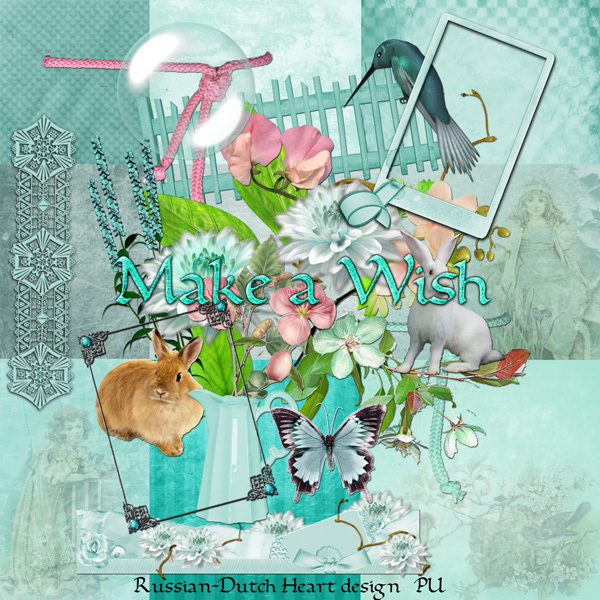 Have a lovely day, be creative and don;t forget to give a little smile here and there!